In Which the Pirate Gets Back To It. Whooooboy, February really threw me for a loop - a phrase which, now that I've typed it, looks as if it's just a wrong way to assemble a group of words. What does that even mean? In this case, it means that the whole month went wrong. :/ I missed a few days of work to take care of family business and another for a snow day, and spent the rest of the (short) month working late to make up the hours. Now we're into a new month and a new pay period, so I get to have afternoons and evenings again! I did manage to finish knitting my new red and white hat. I put a lining in, but I'm afraid that I didn't make it tall enough. 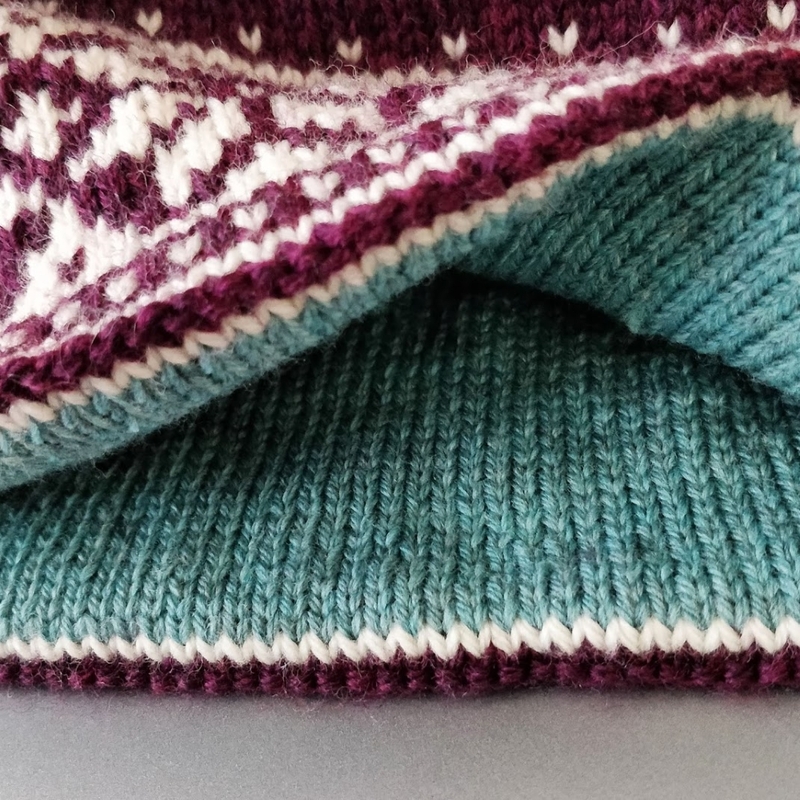 Unlike the other colourwork hats I've done, this lining was meant to have a full inner hat for extra-extra warmth. Blocking probably won't be enough; I know I'm going to have to rip back and add more length... which is why the hat has just been sitting in my bag, ignored, for the past two weeks. The lining colour is pretty excellent, though. Michael and I got the chance to visit my grandma for her birthday, which was a real treat for everyone. She still wears my first real knitting project! It's a basketweave scarf that I made for her birthday in 2005. The thing I remember most about it was how much trouble I had just counting to four, over and over again. I'm just a little better about reading my knitting now. For years, my only picture of the scarf was an in-progress scan, because I didn't have a camera when I made it. Now that I do, I was able to get a proper picture of it. Since it's Red Heart, it looks exactly the same as the day it came off the needles. 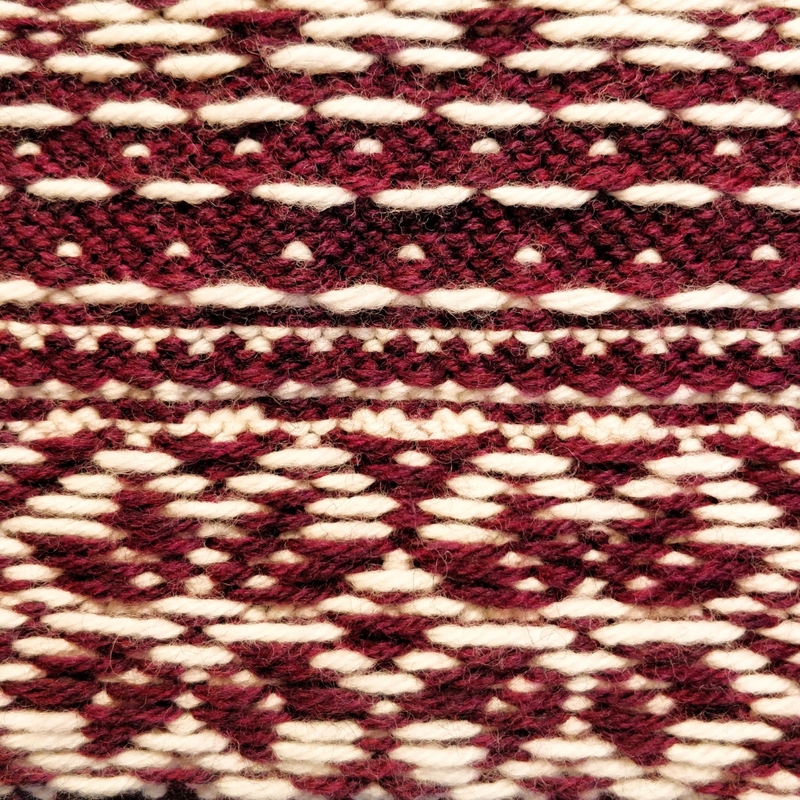 I'll make a separate post about my adventures with the knitting machine. I've been working on a new couch-blanket, but there's enough to write about that it deserves a post of its own. In Which the Pirate Knits the Outside of a Hat. 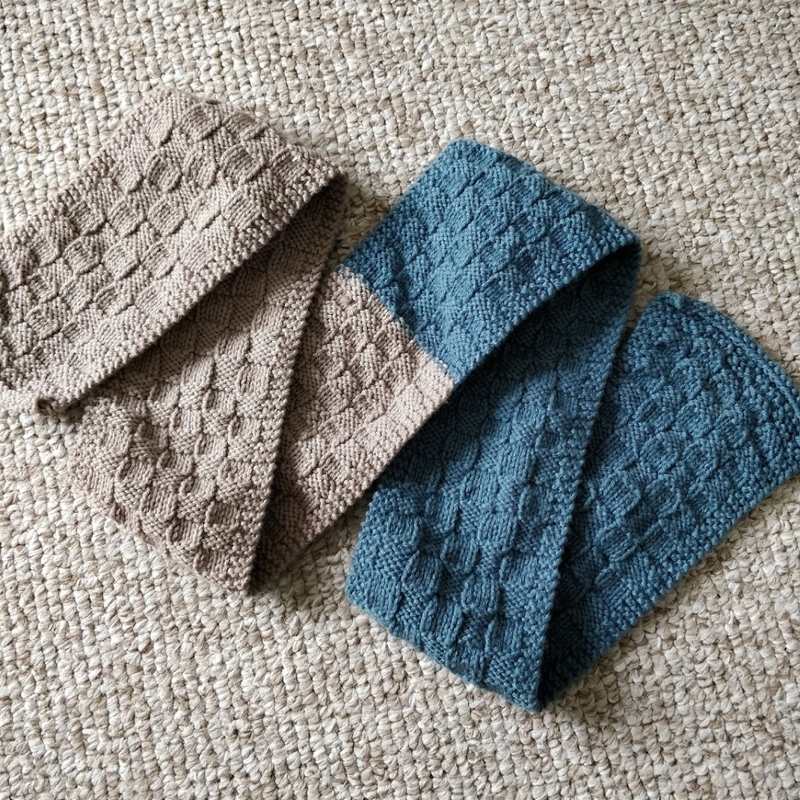 Not that stranded colourwork is particularly difficult, but I feel like I'm done with the "hard part": I finished the outside of my new hat yesterday, and now it's time to unzip the provisional cast-on and knit the "easy part" otherwise known as the stockinette lining. It's almost a shame to cover this up, isn't it? But if I don't, not only will the hat be too big but it will also be less warm than I want. I have a sportweight yarn in a beautiful blue-green that will make a striking contrast. 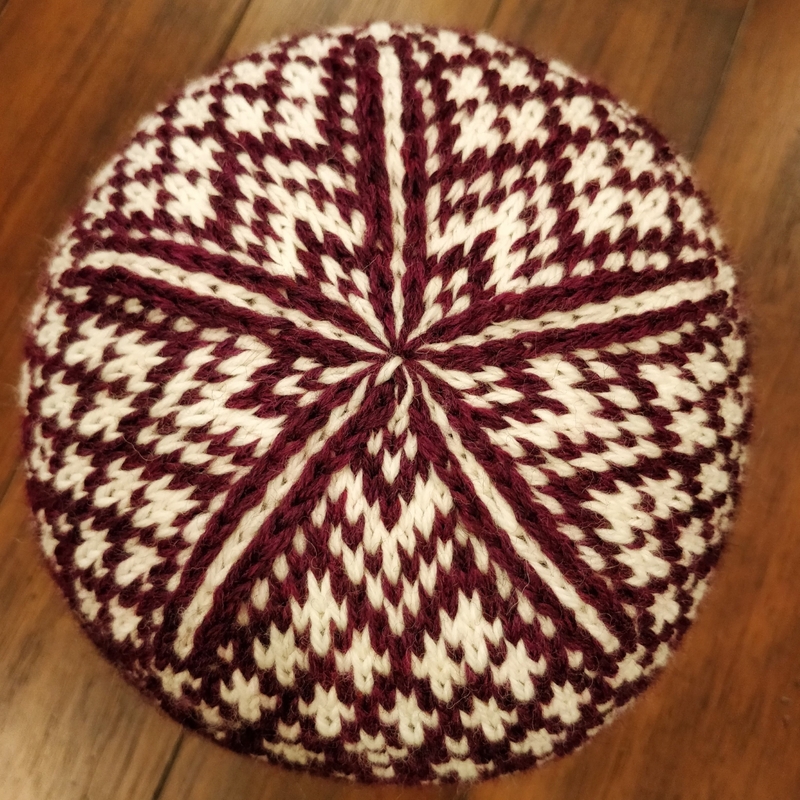 My original thought had been to make an overstuffed pompom for the top of the hat, but now that I'm looking at this nifty star formed by the decreases, I'm not so sure. Maybe I'll sew a button to the inside so that it can be detachable. What do you think - pompom, or no? In Which the Pirate Starts Something New. At this point I really don't need more hats, but I've been having so much fun knitting them that I started a new one anyway. 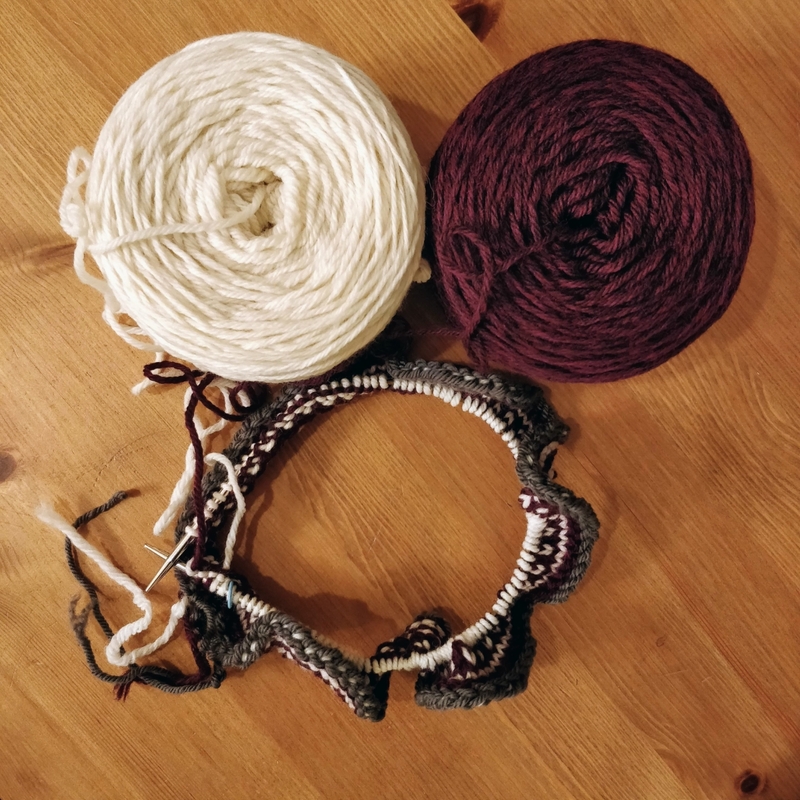 This one will have a snowy theme, and Michael helped me chart it out so I'm doubly excited to knit it. Like the other hats, I'm knitting this in Cascade 220 with a 220 Sport lining, but unlike the other hats I've started with a provisional cast-on. 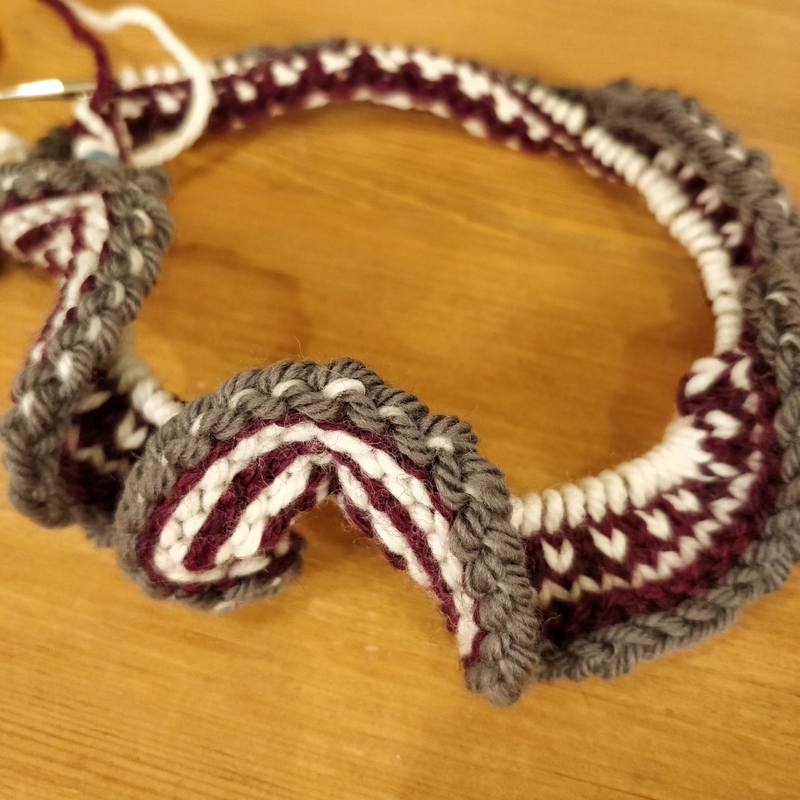 It's something I've never done before, but my mom (who, by the way, has test-knit both the Crossing Trails and Hollis Hills hats) suggested it as a way to avoid the annoyance of having the lining curl up into the work while you're trying to knit. The funny thing about that is that the provisional cast-on is even more in the way, as the chain is fairly loose... oops? Have I done it wrong? I looked up several variations and decided to try the one where you crochet directly onto the needle and go from there, rather than attempt to pick up the stitches from a long chain. Once I had all the stitches I needed on my needle, I chained a few more before cutting the yarn and pulling it through the last chain. That will make it easy to "unzip" when it's time to knit the lining. My goal is to have this hat knit and the pattern written up for publication before it starts warming up too much. I'd love to wear it on one of our snowboarding trips this winter!